Are you concerned about bruising after fillers or a procedure? Are you suffering from an overuse or sports injury? With topical Arnica+K Cream plus Homeopathic Arnica Montana (bottle and blister pack), our Arnica Bruise Kit works synergistically to restore bruised skin. 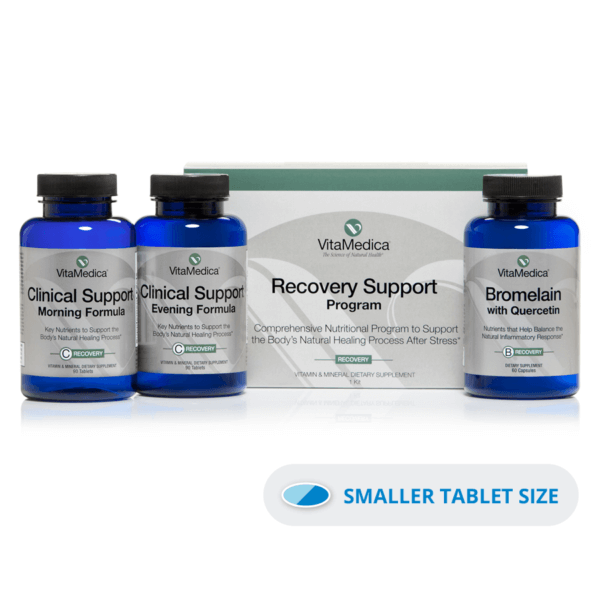 Whether scheduling your next procedure or participating in a physically demanding sport, be prepared by having a VitaMedica Arnica Bruise Kit on hand. Arnica+K Cream Ingredients: Water, Cyclopentasiloxane, Isopropyl Palmitate, Ethylhexyl Isononanoate, Ethylhexyl Palmitate, Cetearyl Olivate, Sorbitan Olivate, Phosphaticylcholine, Glyceryl Stearate SE, Stearic Acid, Cetearyl Alcohol, Alcohol, Glucosyl Hesperidin (Bioflavonoids), Dimethicone, Arnica Montana, Escin (Horse Chestnut), Beta-Sitosterol, Bisabolol, Allantoin, Tetrahexyldecyl Ascorbate (Vitamin C Ester), Chamomilla Recutita (Matricaria) Flower Extract, Butylene Glycol, Vitis Vinifera (Grape) Seed Extract, Symphtum Officinale (Comfrey) Leaf Extract, Citrus Grandis (Grapefruit) Peel Oil, Vitamin K, Glycerin, Gluconolactone, Sodium Benzoate, Acrylates/C10-30 Alkyl Acrylate Crosspolymer, Disodium EDTA, Potassium Sorbate, Sodium Hydroxide. Our Arnica 30X Bottle and Arnica Blister Pack have the same 30X HPUS formulation; however, each remedy has a different dosing recommendation based on intended use. Arnica 30X Bottle is ideal after surgery or injury when bruising and pain may be more significant. Arnica Blister Pack is ideal after injectables/fillers or after a minor bump or bruise. Both products are not intended to be taken at the same time. Directions: Adults: 3 tablets, 3 times a day. Not intended for children under 12 years of age. This product is a sublingual application. Do not handle the tablets. Instead, drop tablets directly under the tongue and let dissolve naturally. Directions: Adults: 2 tablets, 3 times a day. Not intended for children under 12 years of age. This product is a sublingual application. Do not handle the tablets. Instead, drop tablets directly under the tongue and let dissolve naturally. WARNINGS: If pregnant or breast-feeding ask a health professional before use. Discontinue use if any adverse reactions occur. Contact your physician, if symptoms do not subside within 14 days. KEEP OUT OF REACH OF CHILDREN. In case of overdose, get medical help or contact a Poison Control Center right away. Do not use if seal is broken or shows any signs of tampering. Directions: Apply a thin layer of cream to desired area. Reapply 3 times daily as needed. 1. What is the primary benefit of using Arnica Bruise Kit? It is believed that Arnica Montana increases the flow of blood through the affected capillaries causing escaped fluids to be absorbed. The absorption of the fluids makes black and blue marks go away faster and reduces the swelling, relieving the pressure on nerve endings. This, in turn, relieves the pain and stiffness. Arnica also stimulates white blood cells, which then help disperse material trapped in bruised tissue, muscles, and joints. 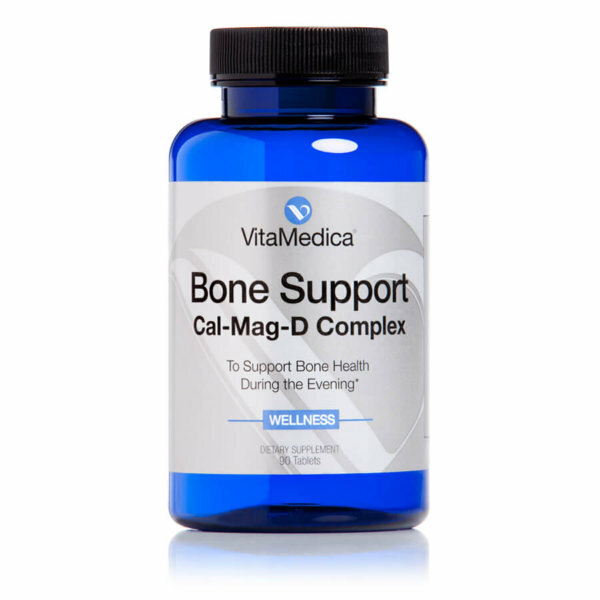 Vitamin K is well-known for its role in reducing bruising. Botanicals like vitamin C ester, hesperidin, horse chestnut, comfrey and grape seed extract help strengthen capillaries and improve micro-circulation in the dermis. 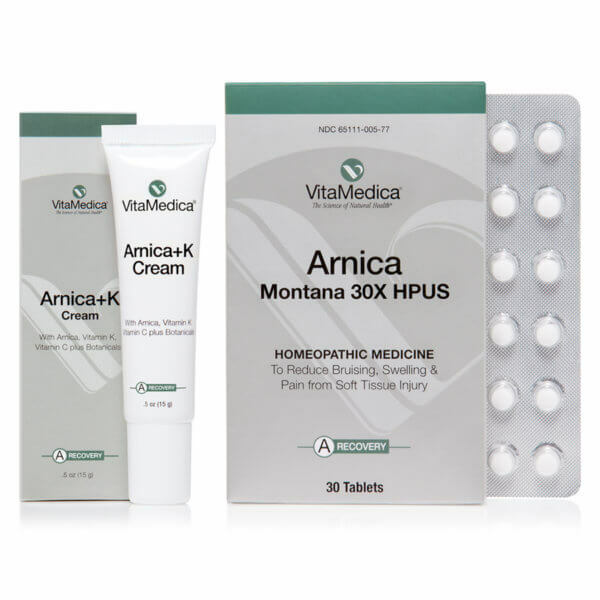 VitaMedica’s Arnica Montana 30X potency tablets were developed with the expertise of Apotheca – a company founded in 1987 which uses FDA registered facilities to produce the highest quality homeopathic products to the U.S. market. The formula is designed to meet the needs of patients suffering from soft tissue injury due to minor surgical procedures, trauma, or injury. 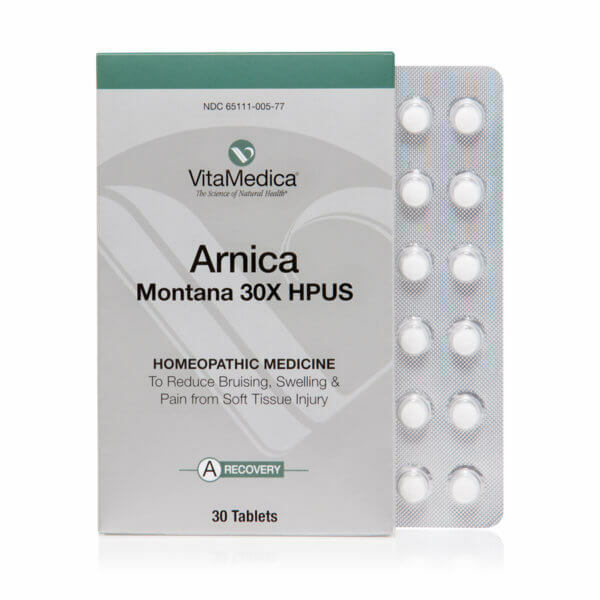 For convenience, our Arnica Montana Blister Pack is provided in a 5-day blister pack containing 30 tablets. 3. Who should use Arnica Bruise Kit? Arnica Montana contains compounds that are especially important for the reduction of bruising and swelling from soft tissue injury. Arnica Montana is ideal for Ideal for sprains and strains from overuse or sports injury and following filler injections (e.g., Radiesse®, Restylane®, Juvederm®). Packaged in a convenient five-day blister pack, Arnica Montana Blister Pack is perfect for busy, active lifestyles. Arnica+K Cream is ideal for the bruising and swelling that often accompanies facial surgical procedures like rhinoplasty (nose job), rhytidectomy (facelift) and blepharoplasty (eyelid surgery); non-surgical procedures like laser and fractional resurfacing (e.g., Fraxel®) and sprains & strains from overuse or sports injury. 4. Who should not use Arnica Bruise Kit? 5. 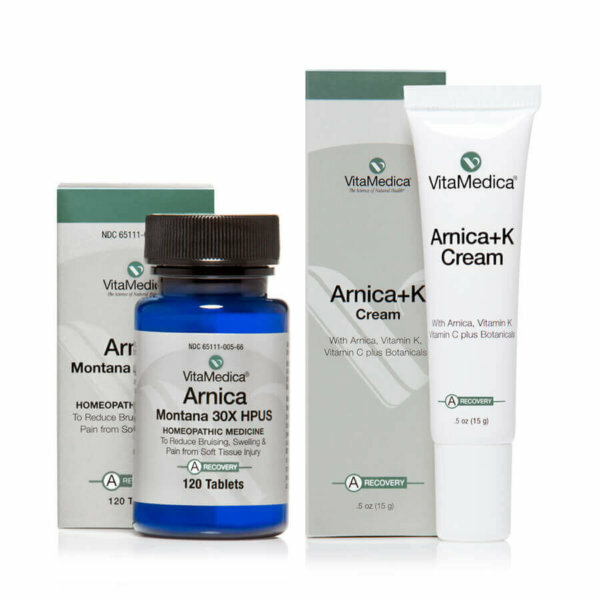 When do I start using VitaMedica’s Arnica Bruise Kit? When do I stop taking the products? For surgical procedures, begin taking Arnica Montana 30X either the day before or immediately following your procedure. Continue taking for five days. 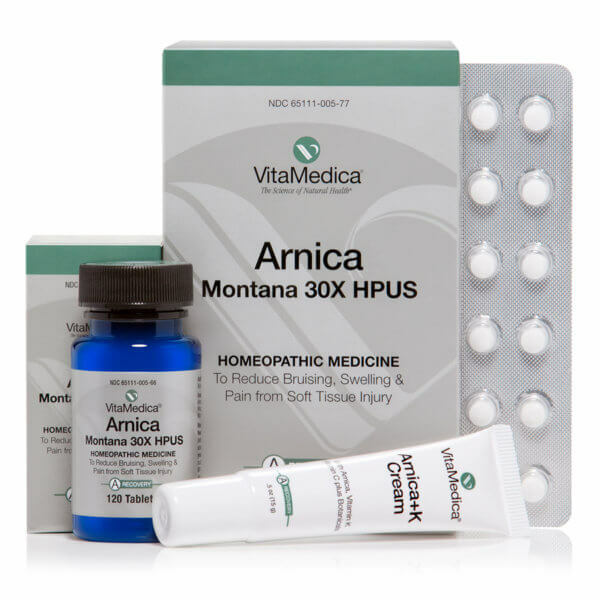 For trauma or injury, begin taking Arnica Montana 30X immediately following trauma or soft tissue injury. 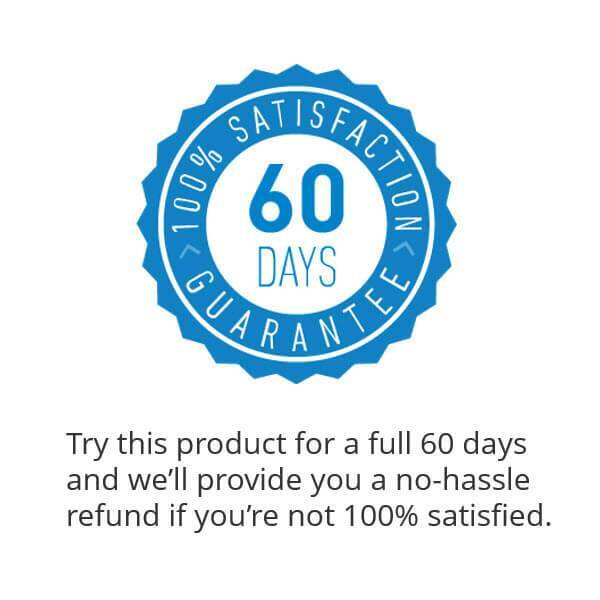 Continue taking for five days. Also known as “purified escin,” this botanical can be used on its own but forms part of the compound that makes up the complete horse chestnut extract. It is becoming very popular in phytomedicine, due to the clinical evidence of its effectiveness in the treatment of vascular and circulatory disorders. Aescin or escin is a mixture of saponins with anti-inflammatory, vasoconstrictor and vasoprotective effects found in Aesculus hippocastanum (horse chestnut). Escin is the main active compound in horse chestnut and is responsible for most of its medicinal properties. High-quality evidence suggests aescin is a safe and effective treatment for chronic venous insufficiency. In one randomized controlled trial, horse chestnut extract was found to be as effective and well tolerated as the use of compression stockings.